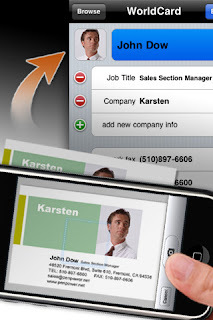 Home Applications WorldCard Mobile and WorldCard Contacts apps on your iPhone will make your life easier! WorldCard Mobile and WorldCard Contacts apps on your iPhone will make your life easier! Most likely you are aware of Worldcard Mobile's existence and functionality, but wait a minute, have you heard something about the latest iPhone version of WorldCard Mobile and how it works together with WorldCard Contacts? If your answer is yes then let me just remind you and introduce those of you who haven’t learned about the product yet, to its capabilities. With The latest iPhone Version of WorldCard Mobile, your business card is captured and recognized by taking a photo with your 3GS iPhone. Recognized data is sorted automatically by name, company, position, address, phone number, email address and other fields and added to your contact list. Just point your camera at the card, take a picture, and WorldCard Mobile puts it into your address book. With the help of OCR technology, information from the business card is saved as searchable text in the language you'll choose under the card's image. But it is not all! 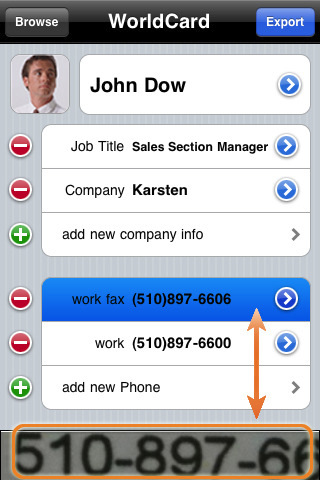 For those who want to store actual business card images together with contacts, Penpower Inc., the creator of WorldCard Mobile, offers another app called WorldCard Contacts. This app serves for enhancing your ability to browse contacts in smart ways (custom groups, images, etc) and make phone calls/send SMS/ and Search Maps directly. How this two apps work together? Tap the WorldCard Contact icon to use OCR from Worldcard Mobile inside of Worldcard Contacts, take a card image and choose your desired language recognition to save this card info with image and text. WorldCard Mobile will sync with WorldCard Contacts to extract, store and place the card's info into an interactive directory. Having both applications will make your life easier!